As I noted a while back, critters have taken up residence in my bee condo. But they do not seem to be orchard mason bees. 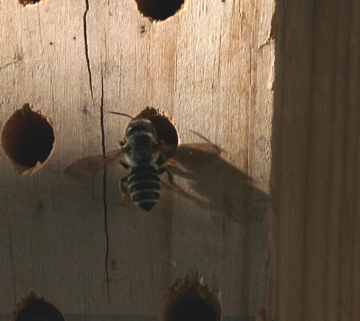 When an orchard mason bee moves into a condo like this, the signs are a rough mud plug in one of the holes. The bees use the holes to protect their offspring and fill the holes with baby bee food before plugging it up for safe keeping. I have mud plugs, finally, but they are not rough. They are smooth, which I originally thought was a wasp, but the holes also include lots of cut up grass, which is not the usual m.o. for orchard mason bees. I did manage to catch a photo of one of the occupants leaving the condo the other day. He is longer than a bumble bee, also thinner, with a pronounced waist. Unlike the orchard mason bees, which are usually bluish, this bee was black and yellow.